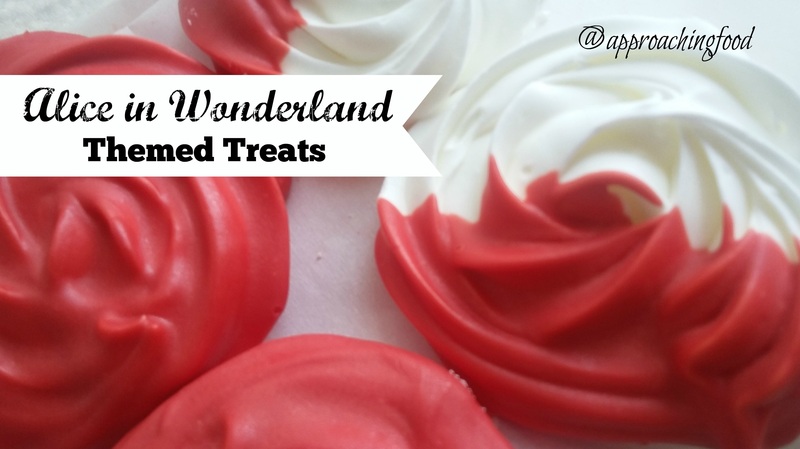 Three Easy Ways to Bake Alice-in-Wonderland Themed Treats! Pretty, painted meringue roses that melt in your mouth! I generally don’t sell my baking, preferring to a) eat it (best part of baking, amirite? ), b) bring it to work, or c) have the DH bring it to his work (our colleagues are most appreciative). Recently, however, when someone I didn’t know asked me to do some baking for a themed baby shower, I thought, why not? And baked up these yummy ‘Alice in Wonderland’ themed treats! What treats did I make? 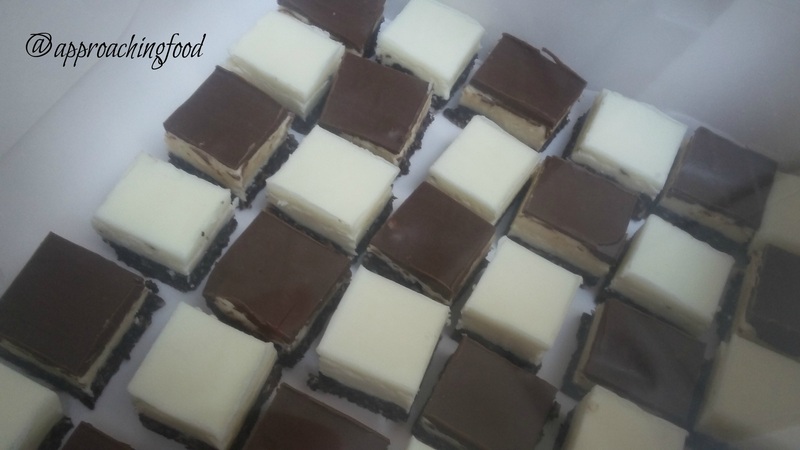 Chessboard Nanaimo Bar Squares, Painted Rose Meringues, and Spotted Mushroom Cupcakes! And honestly, they were so easy to make. Want to make some yourself? Let’s! Use my nanaimo bar recipe, but use a lasagna pan instead of a square pan. And, before you add the final chocolate layer, cut the giant block of nanaimo bar in half. Then ice one half in chocolate and ice the other half in white chocolate (that’s what the white chocolate wafers & oil is for). When set, cut into squares and arrange in a chessboard pattern. Et voila! Wasn’t that easy? What a delicious Nanaimo bar chessboard! As you all know, I like to use real ingredients to create delicious treats…and then consume them when they’re fresh, because why wait to eat yumminess? Which means that when I made the Spotted Mushroom Cupcakes, I didn’t use a cake mix or canned frosting, but mixed up the batter from scratch, along with some vanilla buttercream! I actually used coconut oil instead of shortening in my vanilla buttercream recipe, and that gave the buttercream a coconutty taste — extra yummy! The DH came by the kitchen as I was baking, and tasted the buttercream. His reaction? “MMMMMMMM!” I think that says it all. Using the green cupcake wrappers, bake the cupcakes according to the directions. Whip up the buttercream according to the recipe, except use coconut oil in place of the shortening. Using a butter knife, spread icing over the top of each cupcake to create a smooth dome. Place 2 or 3 red wafers on each iced cupcake. Then, place the remaining red wafers in a cup along with the oil and microwave in 30 s. bursts until melted, stirring every 30 s. Once melted, pour into a Ziploc bag, and cut a very small bit off of one corner. Pipe small red dots onto a sheet of waxed paper. Set the waxed paper in the fridge to set. 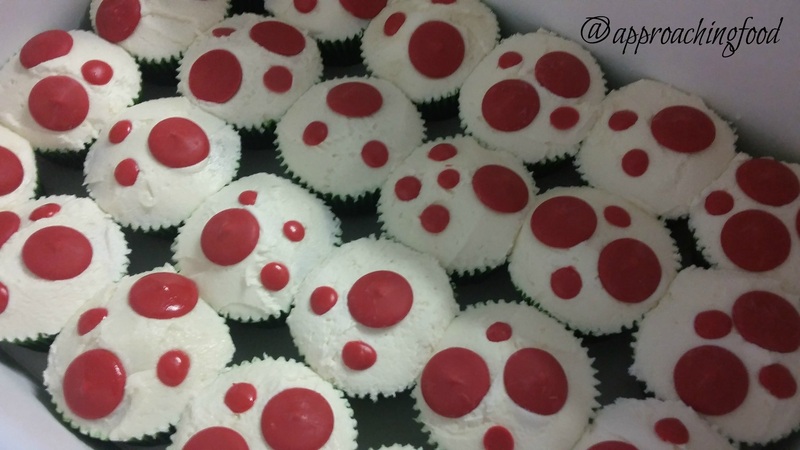 Once the red dots are solid, place two or three red dots on each cupcake. Et voila, your Spotted Mushroom Cupcakes are done! Do you remember the part in ‘Alice in Wonderland’, where the Queen orders her white roses to be painted red? Well, we can do the same, only with roses made out of meringue! Mix up the batch of meringue batter. Cut the tip off the piping bag, and attach the piping tip. (If you don’t have a piping attachment, don’t worry, just place the piping tip inside the bag and it will work just fine.) Scoop the meringue batter into the piping bag and twist the top closed. Pipe roses onto a baking sheet. How to pipe a rose? Start in the centre, and pipe a swirl. The 1M piping tip makes the swirl look like a rose! Bake according to meringue batter instructions, or until the meringues are lightly golden on the bottom, and thoroughly dry throughout (I usually break one in half to check the done-ness. And then eat it. Hazard/benefit of the job, right?) When done, remove to a cooling rack and let cool thoroughly. Mix wafers with vegetable oil, and melt in microwave, in 30 s. bursts, stirring in between each 30 s. When thoroughly melted, pour into a shallow bowl. Dip 1/3 of the roses top down, so that the tops become completely covered in red. Then set these back on the cooling tray (I suggest placing a piece of wax paper underneath to catch all the drips). Take 1/2 of the remaining meringues and dip half of the cookie in the melted red wafers, so that it looks as though someone half-painted a white rose. Set back on cooling tray. Let the candy coating set. If you’re in a hurry, you can place the cooling racks in the fridge to set faster. Once done, arrange the roses on a platter, with some red roses, some white roses, and some half-painted roses. Deliciousness, thy name is meringue! Wasn’t it easy to make those ‘Alice in Wonderland’ themed desserts? They’re just basic recipes, but with the design slightly tweaked so that they fit with an ‘Alice in Wonderland’ theme. Do you have an ‘Alice in Wonderland’ themed party coming up? Why not try these out? Not only are they delicious, but they’re fun to look at too! If you do bake these treats, be sure to email me some photos! I’d love to post them on my social media channels! Next Post: Baked Falafel Croutons! Say what? That’s right! An easy way to add vegetarian protein to your salad! Linking Up at Meal Plan Monday! And Happiness is Homemade! And also at Full Plate Thursday! This entry was posted in Cookies, Desserts Not Otherwise Categorized on September 11, 2017 by Margaret. Gosh! Everything looks wonderful. You should cater more often. When I home schooled the boys I made them read the original Alice in Wonderland book. It is amazing how many of the expressions we use today came from that book. My favorite, “Off with her (your) head!” was used quite often when they would not study. I once read a National Geographic feature on the author of Alice in Wonderland. He was quite the character, I have to say! Great ideas Margaret. These look pretty and delicious !! Your Cupcakes look awesome! Thanks so much for sharing with us at Full Plate Thursday,we are so happy to have you join us. Have a wonderful week and come back to see us real soon!